Below are some images of various clients and friends with bonefish caught in the Upper Keys area on a fly. The conditions and locations (Key Largo, Tavernier, Plantation Key, etc) vary from keys in the back country to ocean side flats. As I have more time, and take more pictures, Ill keep adding them to this gallery. Bonefishing in Key Largo and the Northern Keys can be epic. We have many flats on the Oceanside and in Biscayne Bay. Just to the north of Key Largo. The fish avg. 5 to 7LBS. There are bigger fish as well topping 13lbs. The flats are beautiful and the water is clear. Personally It is my favorite area to catch a bone fish on Fly. 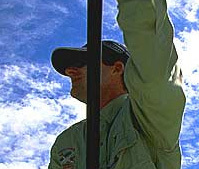 Islamorada Bonefishing: Islamorada is the birth place of Bonefishing on the Fly. Most of the world records have come From the downtown flats. There are oceanside flats and bayside flats that hold fish of all sizes. Any given day you may have the opportunity to be fishing to a world record bonefish. I supply all the fly tackle flies and leaders. You are welcome to bring your own gear. I recommend a 8wt. or 9wt. and also a 10wt. for the very windy days. That’s when the giants come and play. Near Sands Cut Biscayne Bay. Large Fall Key Largo Bonefish.